As a skilled poker player there is nothing more frustrating than sitting next to someone who doesn’t know the first thing about poker. But worse than that is basing Poker play on pure luck with no strategy whatsoever. That is what a “Bingo Player” is at the Poker table. The Poker table is filled with many types of characters including the bluffer, chip & chair and fish. With a bit of observation it doesn’t take long to figure out what type of competition you’re up against and can play your hands accordingly in a skilled manner to beat your opponent at their own game. 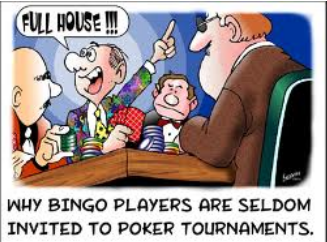 Unlike the bluffer, fish or chip & chair player, the Bingo player has absolutely no skill or strategy and can be the ultimate aggravation for an advanced Poker player. The flop is 3 hearts, you bet and the bingo player calls it, turn card is a heart you bet again, he calls it, river is a heart for a possible flush between you and the Bingo player. He calls your raise and wins the pot with a lousy 2 of hearts. The Bingo player’s mind set is to believe in sheer luck to claim victory. He is known for making horrible poker calls with nothing in his hand to back it up. All the while he will boast about what a great skilled player he is when he wins and when he loses chalk it up to just bad luck. When in reality, his entire game play is luck related only. 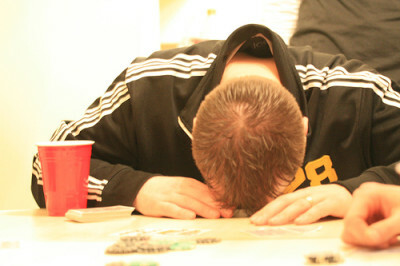 It can be somewhat of an insult to the seasoned poker player that has devoted his time in developing in his own personal strategy to only get knocked out by a player that has no real business at the poker table period. Poker should never be considered a game synonymous to playing online Bingo where the balls are called, numbers are dabbed and with complete luck you are holding on to the winning card to claim a win. If luck is the only thing factored in then there are plenty alternatives in gambling including Slots, Scratch Cards, Keno and Lottery games. On a positive note sooner or later the river will eventually drowned the Bingo player and skill beats luck overall. This is what separates the boys from the men and the ladies from the girls as skill perseveres and is the true victor in the art of poker playing. This is not to discount games of sheer luck including Bingo, Slots and Keno. Play the right game and at the right site for games of luck by checking out www.bingoreviewer.co.uk, your complete source of online Bingo games and more.